I enjoy playing World of Warcraft, but with each new expansion my desire to revisit the leveling grind to test out a new race or class dissipates further, something not even the updates older zones received in Catacylsm managed to alleviate. Now that Legion is here the level cap went up by another 10 levels to a daunting 110 in total, extending an already lengthy process for those looking level another class. For someone like myself who values much more the endgame battlegrounds and raiding rather than the process of reaching them, a leveling guide such as Zygor’s is invaluable for the time and frustration it saves, and even though I’ve completed the leveling process enough to have already memorized the path, Zygor’s offers features such as automatic quest accepting and turn in as well as waypoints for every necessary objective and NPC that make it that much easier to accomplish. Of course, that isn’t to say that what Zygor’s has to offer won’t be of use even to new players on their first character and looking forward to enjoying the journey to maximum level. whether you intend to pursue the endgame at breakneck speed or take a more relaxed jaunt to 110, Zygor’s Leveling Guide is a helpful tool for making certain you spend more time enjoying yourself rather than figuring out what to do next. 1. As mentioned above, a waypoint directional system that allows you to easily identify and reach your target be it a specific location or quest NPC. 2. Step by step instructions on what materials to prepare in advance when necessary, saving you the need to waste time backtracking. 3. 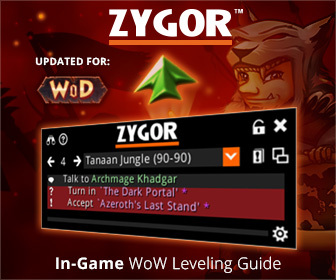 Zygor’s guide will automatically update to your level and quest progress. This makes it easy to jump in and start using the guide with any character, and if you want to take a break and level up a bit by running dungeons or battlegrounds it’s a simple process to re-adjust the guide to match your new level progress. Additional features include automatic quest accepting and turn in, automated flight path usage, and a number of other settings you can customize to suit your preferences. To summarize, Zygor’s offers the complete package of tools necessary to make the leveling process as smooth and easy as possible, removing any doubt as to your next objective or what zone you should be in as well as providing detailed instruction on the completion of each and every quest. Here’s an example video of Zygor’s Guide in action. Hey, your Zygor Guides review is very well written. It feels good to know that you are also a fellow WoW player! I just used Zygor to get a new DK to 90 at a very comfortable pace. Wouldn’t level without it unless I was tanking dungeons (which I’ve done) or PvP leveling or somesuch.